This skillet dish can be prepared as a special occasion treat, but is simple enough to make for an easy yet delicious dinner. If you’re trying to impress family and friends without breaking a sweat, Chicken and Prosciutto Sorrentino is the way to go. 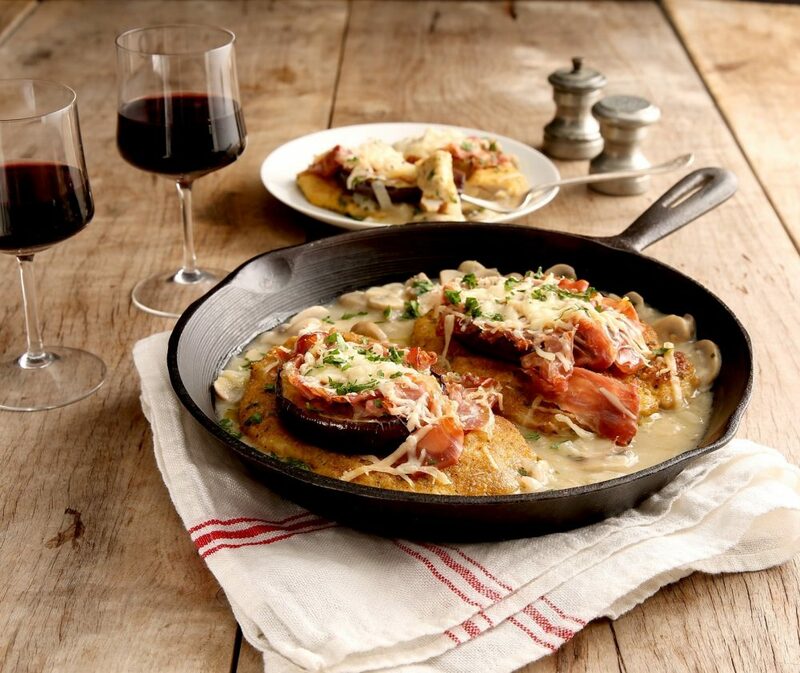 The red wine adds extra depth to the chicken, while the melted cheese complements the Prosciutto di Parma perfectly. This dinner is truly the perfect comfort meal to combat the cold weather and will become an instant classic especially when paired with your favorite red wine. Keep the rustic look and feel of this chicken dish by serving straight out of the skillet. Melt 2 tablespoons butter in large non-stick skillet. Cook shallots and mushrooms until mushrooms are golden and mixture is tender, 7-8 minutes, stirring occasionally. Add wine and boil 1 minute. Combine broth and flour until blended. Stir in broth mixture and bring to a boil. Reduce heat and stir in remaining butter and simmer until melted. Transfer sauce to serving dish and keep warm. Wipe skillet clean. Heat 1 tablespoon oil over medium high heat and cook eggplant, turning once and adding an additional 1 tablespoon oil, until browned and tender; set aside. Dip chicken in eggs, then breadcrumbs to evenly coat. In same skillet, heat remaining olive oil and cook chicken until browned and cooked through, turning once. Top chicken with eggplant, prosciutto and shredded cheese. Reduce heat to low and cook, covered, until heated through and cheese is melted, about 4-5 minutes. Arrange chicken on serving dish and top with mushroom sauce. Sprinkle with chopped parsley.